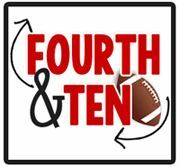 Fourth and Ten: March Product Giveaway! Happy March! My goodness, where has the time gone? ;) Before we know it, it will be spring break, St. Patrick's Day, and Easter! To celebrate, I'm giving away ALL of my March/Spring themed items! 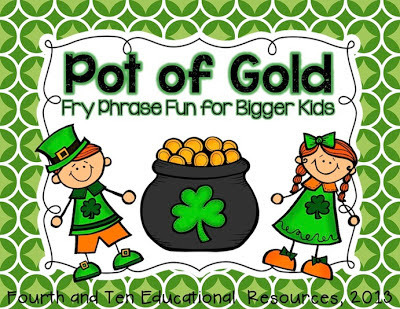 First up, March's fry phrase fluency building game, Pot of Gold! I bought the cutest little leprechaun hat to hold the cards. My students have LOVED playing our fry phrase games this year! 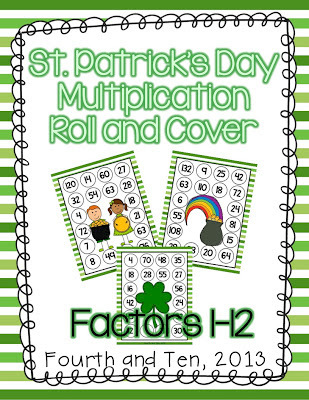 Next up is St. Patrick's Day Roll and Cover! It's amazing what fresh clip art can do for motivation! My students get so excited when I put a new set of games into our math tubs. :) Plus the extra multiplication practice has made a big difference as we work through more difficult math. Want to win? All you have to do is enter via the Rafflecopter widget below! :) I'll be contacting the winner on Thursday! :) Good Luck! Thanks for this offer. I'd like the Fry Phrases most of all, I think. 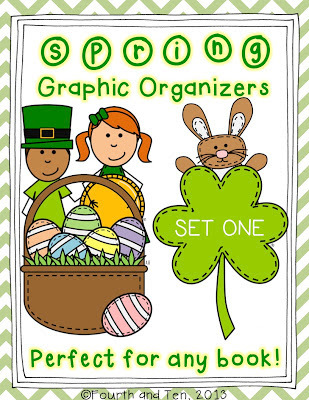 I am excited about all of your great products but MOST excited about the graphic organizers. I can't have enough of them to help my 4ths reading and writing stay structured and organized. Thanks for the great resources!! My students absolutely love your Fry phrases. They are wonderful with my ell students. 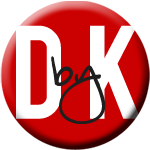 I LOVE your products(I think I'm your biggest fan!) I'm really interested in the Fry phrases. I've never used these with my third graders and this would be a great introduction! The graphic organizers or factor activity would be awesome. Have a great weekend. I am most excited about your graphic organizers. I can use those any day! I teach a third grade intervention block and the fry phrase game is always a hit! 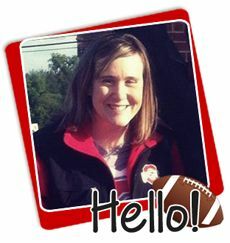 I also teach fourth grade in Ohio and would love to use your graphic organizers! WOnderful giveaway! I'm most excited to win the Fry Words pack - I'm really focusing on sight words this next week in preparation for our state-wide assessments coming up soon. Love your products. But, more importantly my kids love them! I love all 3 products! I would be most excited about the reading graphic organizers. I love your graphic organizers and multiplication roll games. Fry phrases for older kids would have to be my pick ... I have so much for younger students (Kinder to 1st), but kinda run out of things for my 2nd graders sometimes. The graphic organizers come in at a close second though. My kids LOVE the Roll and Cover games! 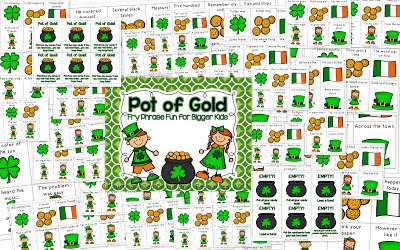 And St. Patrick's Day is MY favorite so my students and I would have tons of fun with those! I can't pick just one favorite! I've been wanting to incorporate fluency phrases into my classroom for while now. 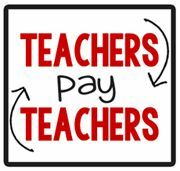 I have all of your seasonal graphic organizers which I use with my Guided DEAR independent contracts, and my students always love the roll and cover games! I am most excited to use the Roll and Cover because my students love these and can always use the extra practice! I love all of the products but I think I'd like to try the Fry Phrases! I like the graphic organizers! Everything looks so great i'm not sure I can pick just one!!! Probably the graphic organizer set : ) Thanks for a great giveaway! Woohoo! Thanks so much, Lisa! I can't wait to print these out and use them!! Hi Lisa! Just found your blog from a link at Fun in First. Looks like your blog meet up was a lot of fun! 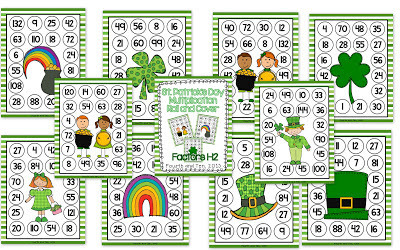 I love your St Patrick's day multiplication game. There is nothing like a theme (especially a holiday) to make kids thinking they are doing something fun and exciting! 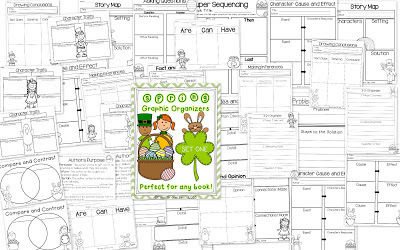 I guess I missed the St. Patrick's day theme for the year, but am looking forward to trying out other spring themes with my kiddos!